After Friday’s cold front, the long weekend came good with some fresh, bright weather. Making hay, we headed down to Cape Agulhas and did stuff like braai, y-bike along the road with the daughter, walk along the beach with the beagle and light a big fire (in the fireplace, not some sort of random arson). I’d share a photo, but I’m still working on getting large photos onto blog posts. It’s not as simple as it seems. I’ll get there. It’s red wine and brandy weather too. Please excuse me while I recognise this. Author 6000Posted on April 30, 2016 April 30, 2016 Categories cape agulhas, positive thoughts, this is south africaTags brandy, fire, red wineLeave a comment on Fire! I don’t actually know who Mr or Mrs (or Mx) van Ryn was (I could look it up and I may well do so, just not right now), but I do know that s/he/they/it makes exceedingly good brandy. 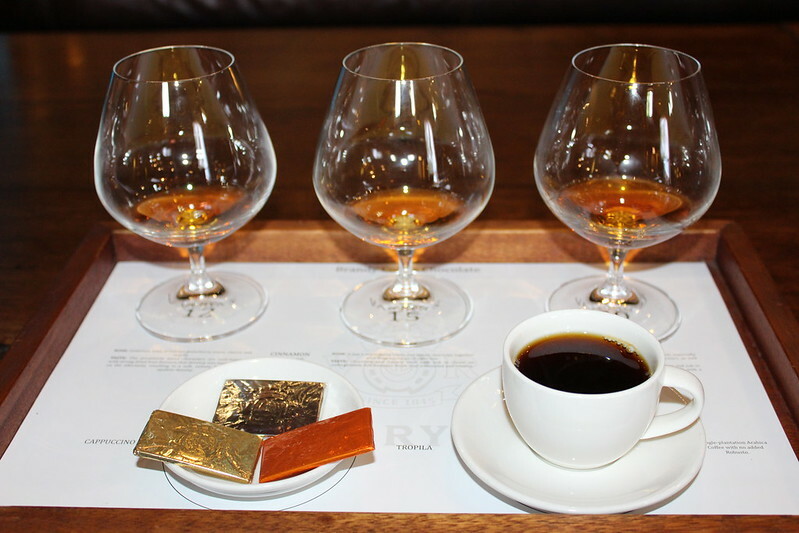 After a busy day in the lab, with further commitments this evening, a quota photo of that distillery’s beautifully presented brandy and chocolate pairing is just what is called for. Later, actual chocolate and brandy may also be called for, but that’s an entirely different story. Those of you who know me, or who read this blog on a regular basis, will probably be aware that I am partial to the odd glass of brandy when and where I can slip one in. And things over the last 24 hours have conspired to deliver not one, but three Marlon-related bottles of joy. Some 10 year old KWV Potstill brandy, some “ever so special” Courvoisier cognac and some St Rémy glass-encased deliciousness. I’m going to be kept wasted happy for several (if not more) evenings. A Brandy Home is a place where you can sit back, relax and learn all there is to know about brandy. The story of brandy is fascinating – it takes five litres of the finest wine to make one litre of spirit. And then it has to mature untouched for at least three years. There is so much to discover – the heads, the heart, and the tails. Not to mention the Angels’ share… Plan your visit to a Brandy Home today. It’s a great outing and something completely different! And there are maps and guides and ratings – a nice resource. SA does a lot of really good wine tourism, and with the troubles caused by the new visa regulations, it’s such a sensible idea to encourage some additional brandy visits with summer coming up (which, along with spring, autumn and winter, is my primary brandy drinking season) and worth checking out. Disclaimer: No brandy was exchanged for this post (yet – my contact details are here, Brandy people), I just like the idea. After trying the exquisite pairing menu at Gabrielskloof (covered adequately, if not exhaustively here) last week, I’m suddenly the world expert in pairing things. So far, I have paired a steak and some chips – which may seem rather unoriginal, but was nevertheless entirely successful – and then, in a fit of wild and daring experimentation over the weekend, I paired some Black Label with some more Black Label. Repeatedly. It went surprisingly well. As far as I can remember, anyway. Then, last night, the pièce de résistance as I paired some Lindt and Sprungli Chili Chocolate with some Louiesenhof Marbonne Brandy. At first sight, this might appear to some to be nothing more than a thinly-veiled excuse to eat chocolate and drink brandy, and those individuals wouldn’t actually be far wrong. But what an unexpected and serendipitous revelation. Suddenly, the steak and chips thing and the Black Label and Black Label thing paled into near insignificance. This was unequivocally my third and best pairing to date. The tastes complimented each other perfectly, mingling pleasantly before producing something almost akin to a citrus burst upon my palate. I’m no culinary expert, but I’d hazard a rough guess that it was the mixture of chocolate and brandy which gave this result, based mainly on them being the only two things present on or near my palate at that particular moment. Approaching this scientifically, I have decided to further pursue this research by testing the blend again this weekend: reproducibility being the cornerstone of any solid scientific result. It’s probably also worth checking out the components individually (especially the brandy) as well, right? This “pairing” thing may well become a recurring theme on the blog. After all, food is ever so cool right now. Sadly though, the chili chocolate and really good brandy thing was just so good that there’s part of me that thinks that I’ve probably peaked too early (again) and future pairings just won’t match up to this one. Author 6000Posted on May 9, 2014 Categories 6000 recommends, learning curve, positive thoughtsTags brandy, chocolate, food pairingLeave a comment on Pair All The Things! We’re going to pop down to Agulhas again this weekend. Not for any reason other than getting some fresh air and some sunshine and avoiding some cyclists. Actually, I made up that last one, but it’s an excellent added benefit. But it looks like the Agulhas area will also be very busy, because it’s the annual 5spesie fishing competition there this weekend. Last year even the outlying villages in the region were packed enough with large Afrikaners in large double cabs (that car park is usually completely empty). This year looks set to be even bigger, with prizes worth over R150,000 up for grabs. The event, described on the powerpoint-designed flyer as “Net ‘n lekker Boere Jol” (literally “Just a great Farmer’s Party”) sounds like a celebration of fishing and Afrikaans culture. So that’s braais, brandy and bad music, then? Yep. If it ain’t broke, don’t fix it. A rough translation for those in the UK: “Dubbel” = “Double”; “Brandewyn” = “Brandy”; “R5” = “42p”. And for use on Sunday morning: “Eina” = “Ouch”. 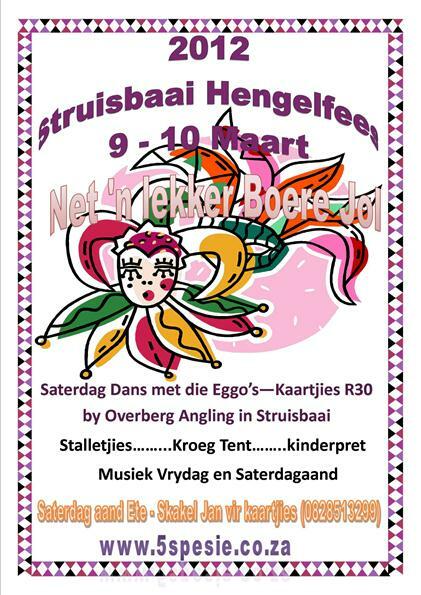 The Music and Dance with the traditional Afrikaans “Orkes” from Bonnievale (and Christelle) is free for sponsors, fishermen, their families and friends. Which seems like reason enough not to befriend a fisherman this weekend, just in case you get invited along. Hopefully, the fishermen will be happy to share the beaches with my kids, who will be looking for (literally) smaller fry in the in the rockpools. See you Monday. (Although by the miracle of modern technology, new posts will appear here on Saturday and Sunday).